We always talk about the benefits of essential oils for wellness, aromatherapy, and DIY household cleaning, but that’s not all that they offer. Essential oils have been used for centuries in perfumery. You might be surprised to learn that essential oils are in many of the designer perfumes and colognes you can buy in department stores today. Essential oils are a natural alternative to chemicals and have a beneficial, lasting effect on our body’s chemistry. They can even act as a powerful aphrodisiac and incite a positive response from others who are around you. AND they smell so wonderful! Essential oils and fragrance oils are two completely different things. You want to ensure you are buying 100% pure essential oils. If the product says fragrance or perfume on it anywhere, it is NOT a natural essential oil. Know what you’re buying. Oils will smell differently on one person than they might on another. Each person has a unique body chemistry that affects the aroma of the oils. It’s natural and might take a couple of attempts to find a blend that’s perfect for you. Don’t give up. Most essential oils will need to be diluted prior to applying topically. Essential oils are potent, and even a small amount can cause skin irritation when not combined with a good carrier oil. For perfumes, I recommend avocado oil because it doesn’t have a scent that will alter the aroma of the oil. For a slightly sweet touch, go with Grapeseed oil. Consider how you wish to apply the oils. My personal favorite is via a rollerball, (you can grab some here) but other alternatives include a diffuser necklace,(learn to make your own here) a DIY balm, lotion, or mist. For blends that you will dilute topically or put in a roller ball, blend with a carrier oil. Try Fractionated coconut oil or jojoba oil and 1 tablespoon of Vodka. If you are planning on putting essential oils in a diffuser or on a necklace, no vodka or carrier oil is necessary. 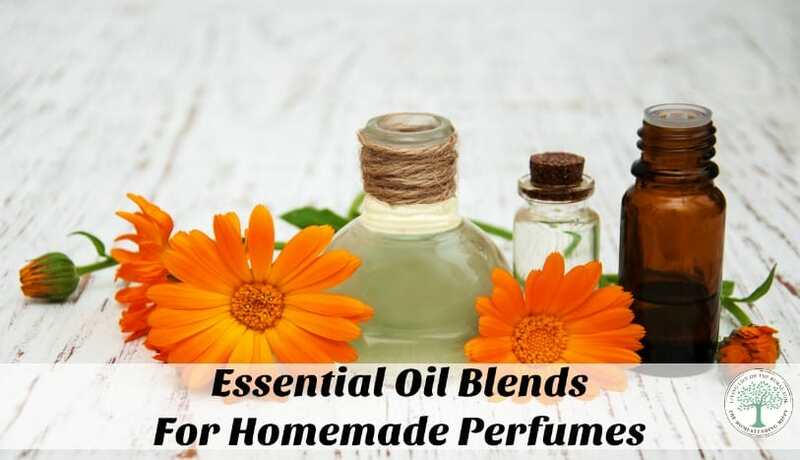 These basic recipes are a great start for using essential oils as perfume and they smell fantastic! Don’t be afraid to start with essential oils that you are already appreciate and build from there. As you gain more experience with oils, there is tons to learn about recipes and blending, and I bet it’ll make a great hobby for you. Meanwhile, save money on the expensive stuff and try out some of these wonderful blends. Others will notice, and you’ll love every minute of your experimenting! Do you make your own perfumes? Be sure to pin this for later!